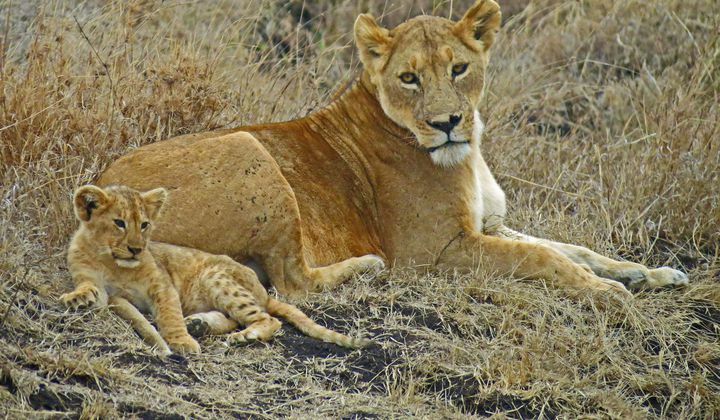 A lioness with her cub. Photo by Myra Little-Porter. Reproduced with permission. It was spring in Tanzania and love was in the air for the birds and the beasts. Anticipating the bounty that seasonal rains would soon bring, the mating game was in full swing. 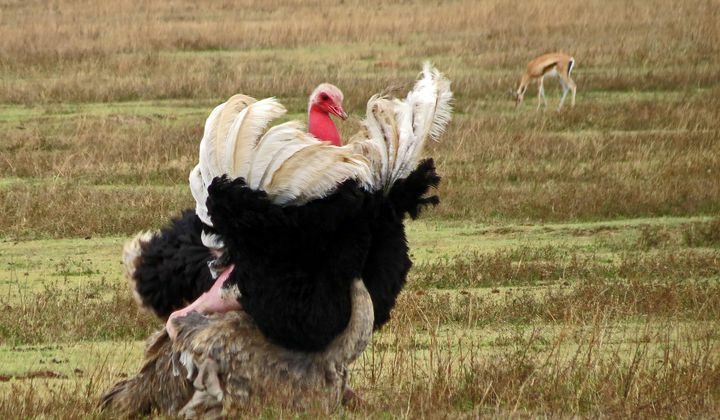 In the heart of the Ngorongoro Crater, the world’s heaviest flying bird was determinedly trying to catch the eye of a nearby female. Typically, female kori bustards are hopelessly seduced by the peculiar sight of a male steadfastly holding his head back and puffing out his throat feathers into a large white balloon. But today, this male bustard’s object of desire was totally immune to his charms. Preoccupied with picking insects off the ground, she passed him by without so much as a second glance. A few miles on, the world’s heaviest non-flying bird was having more luck. Male ostriches have little hope of concealing their amorous intentions during the breeding season. The skin on their necks and legs turns into a blush of scarlet, betraying even the shyest of suitors. We watched enthralled as a male and female performed a graceful pas de deux, slowly swaying their necks and rhythmically folding and unfolding their wings. However, their balletic coupling came to a sudden and disappointing end when the male spied another, presumably more desirable, female and abruptly chased off after her. 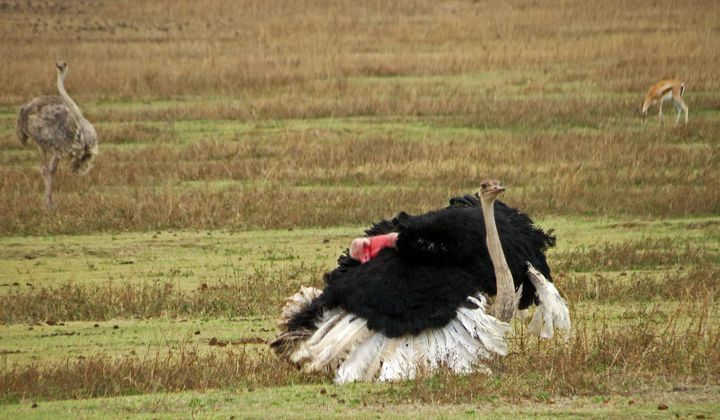 Ostriches mating. Photo by Myra Little-Porter. Reproduced with permission. It takes a lot more than the odd plumage trick or dance move to impress a female weaver bird. Male weavers must show dexterity in crafting intricate homes from strips of grass, reeds or palms, using only their beaks. Everywhere we travelled in Tanzania, males of various weaver species were having a build-off, creating entire suburbs in the thorny branches of acacia trees. Showing great attention to detail, each male takes between between 9 and 14 hours to complete a nest, after which the proud builder attracts females to inspect his handiwork. If a female approves the construction, she will begin the interior decorating, lining the nest with soft grass and feathers, before laying 2 to 5 eggs. It seems love was in the air for the Big Cats too, even though they are not seasonal breeders. Leopards are solitary, well-camouflaged predators that are notoriously difficult to spot. So we were extremely fortunate to come across the rare and extraordinary sight of a mating pair in the Serengeti’s grasslands. Leopards will mate every 15 minutes for up to five days. Unfazed by the crowd of onlookers, the pair delighted us all, allowing photographers second, third and fourth takes, before disappearing into the long grass. A pair of leopards. Photo by Myra Little-Porter. Reproduced with permission. Over the coming days we caught lions, hippos and even a self-conscious pair of tortoises in the act. 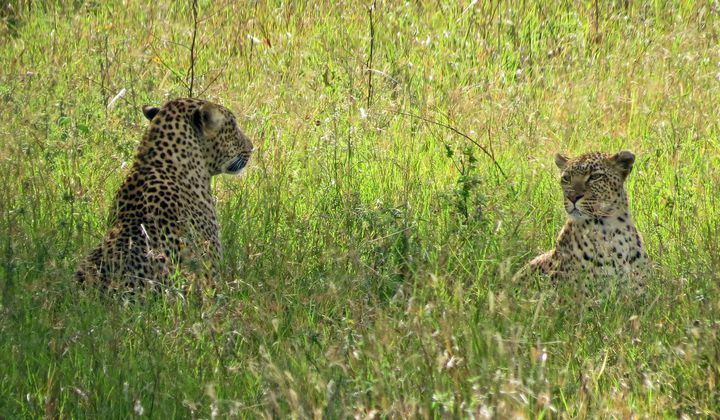 So we can be certain that a few months from now the pitter patter of little feet will resound across the East African savannah. Nearly two decades ago, Zimbabwean-born Robyn Keene-Young left her job as an attorney to live in a tent and document the African wild with her photographer husband. Since then, operating out of remote wilderness, she has shared her intimate moments with some of the continent's wildest animals. Her travel and nature writing has taken her from the deserts of Namibia to the forests of Uganda, the plains of the Serengeti, and the shores of the mighty Zambezi. 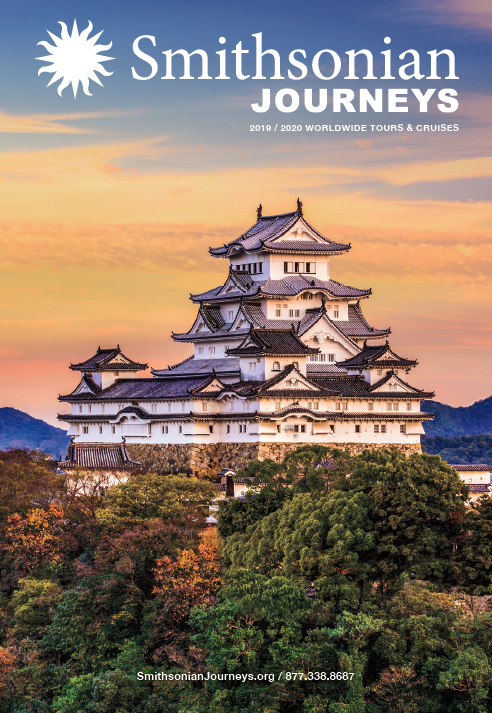 Robyns work has been published in newspapers and magazines worldwide and she is the author of five books on Africa, including Backseat Safari and Africa Unplugged. In 2008 she spent eight months on foot with a troop of baboons in the Okavango Delta, making her Emmy-nominated documentary Swamp of the Baboons. Her latest show, Great Zebra Exodus, about southern Africas largest mammal migration, is currently being aired on PBS Nature.